Wharncliffe gardens estate, belonging to the Grand central Railway. I think this is Aberdeen Place municipal Power Station, belonging to the borough of Marylebone. Grove Road Power Station next to the Regent's Canal. Charles Cundall's portrait of Lord's during the Second Test against Australia on June 25, 1938, looking south from a packed Nursery End towards the Mound Stand and the massive cooling towers of Grove Road Power Station, which formed such a distinctive backdrop for over sixty years. 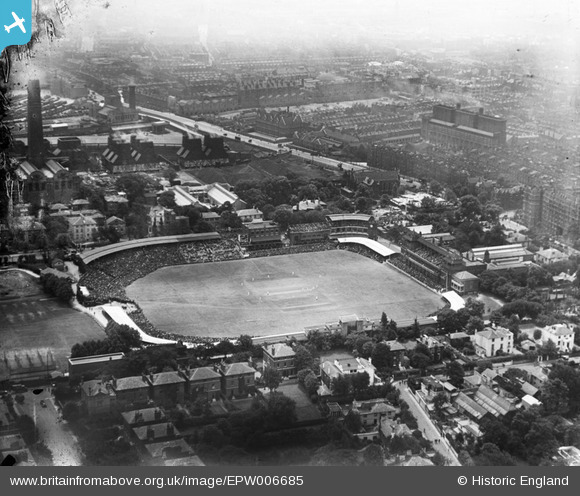 The writer recalls their dominant aspect in his initial visit to the ground in August 1951, but they had been demolished by the time of his last trip twenty seasons later. 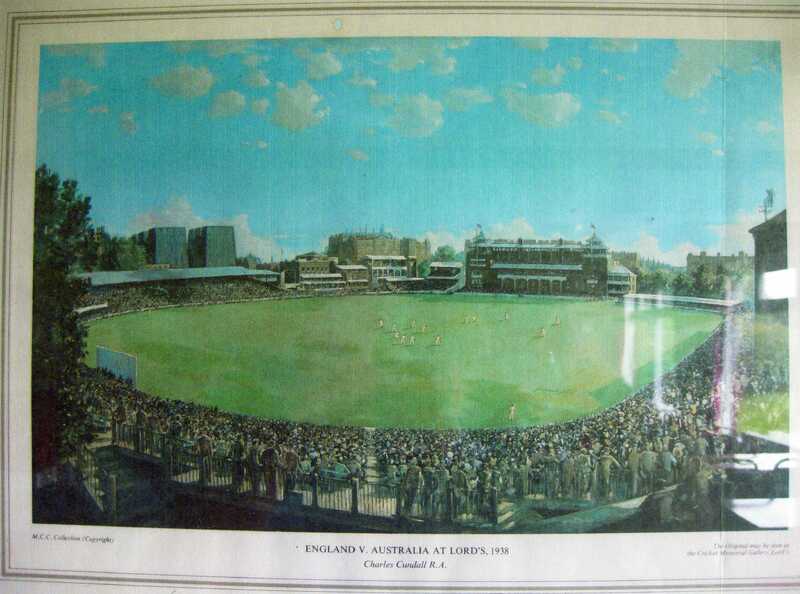 Charles Cundall's famous portrait of Lord's Cricket Ground, looking almost due south from the Nursery Stand during the second Test against Australia. It was probably depicting play on Saturday, June 25, when the largest crowd assembled at headquarters, officially 33,800, witnessed a magnificent display by Wally Hammond, who scored 240 out of a total of 494 in six hours at the crease, including 32 boundaries. The game ended in a draw on the following Tuesday. This picture was issued as a print in 1973 and is reproduced here with the kind permission of Durham City Cricket Club. The second Ashes Test against Australia was held on June 11, 13 and 14, which resulted in a convincing win for the visitors by eight wickets. Wisden Cricketers' Almanack for 1922 reports that the match attracted great attention and on the Saturday (11th), the authorities had difficulty in accommodating the vast crowds, with lengthy delays for the ticket holders. Crowds of up to 32,000 were not infrequent during the 1920s. In the left background, beyond the Mound Stand and to the south of St. John's Wood Road, are the distinctive industrial landmark of the Grove Road Power Station cooling towers, built after 1902 and demolished about 60 years later. 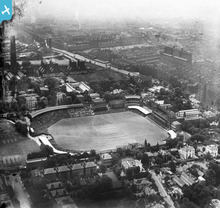 These "dark satanic mills" are a prominent feature in Charles Cundall's panoramic view of Lord's during the 1938 Test Match against Australia.